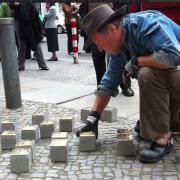 Gleis 17 is the platform in West Berlin from where the Jewish citizens of the city were deported to concentration camps, extermination camps, ghettos, and other mass death sites beginning in 1941. 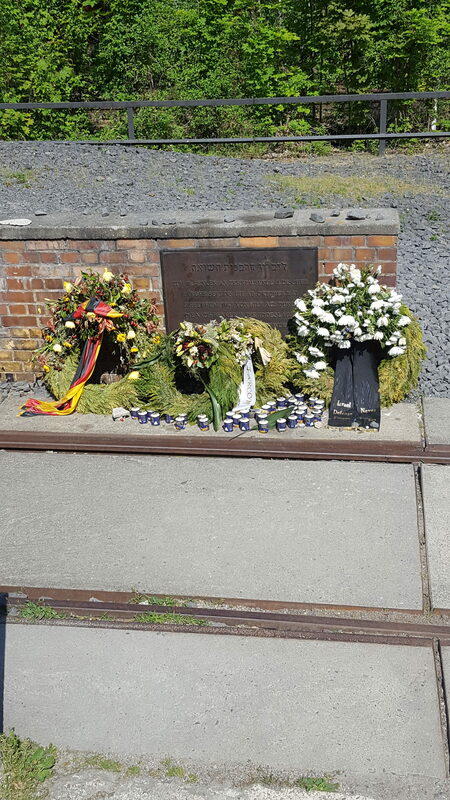 On May 29, 2017, our class visited the memorial at this platform. Here, our German teaching assistant Josefine, who has extensive knowledge on this subject, told us all about what happened at this site. In deporting the Jews, the Germans told the Jewish citizens they would be relocated; they did this to keep them hopeful and to behave in an orderly manner on the long and sometimes fatal journey to the ghettos, the concentration and the extermination camps. These people, being forced, to leave their lives at home and most of their belongings behind had to pay for this transportation to their impending deaths. 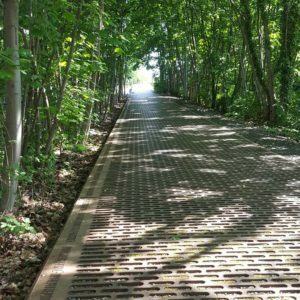 The memorial at this site of deportation can be described as cast iron sheets along the railroad track with the number of people who were deported from this site and where their final destination was. 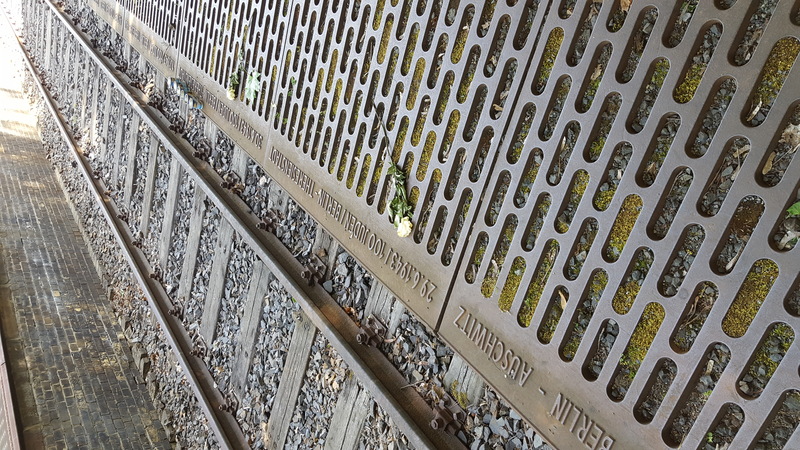 Around 50,000 Jews were murdered or died after leaving this train platform. 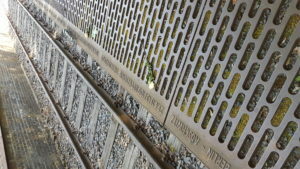 At the point where the platform ends, there is a larger plaque that has words written in Hebrew and in German. 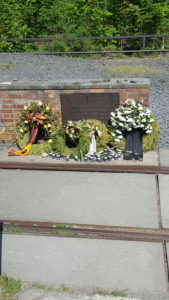 This plaque roughly states that the memorial commemorates the Jews, who between October 1941 and February 1945, were deported from this platform to concentration camps, extermination camps, and ghettos. This plaque had many stones and flowers on top of it. 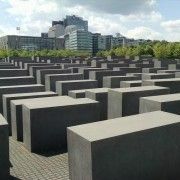 The placing of stones on a memorial or a tombstone is a symbol in Jewish culture to show that somebody was there remembering a person or an event that took place. 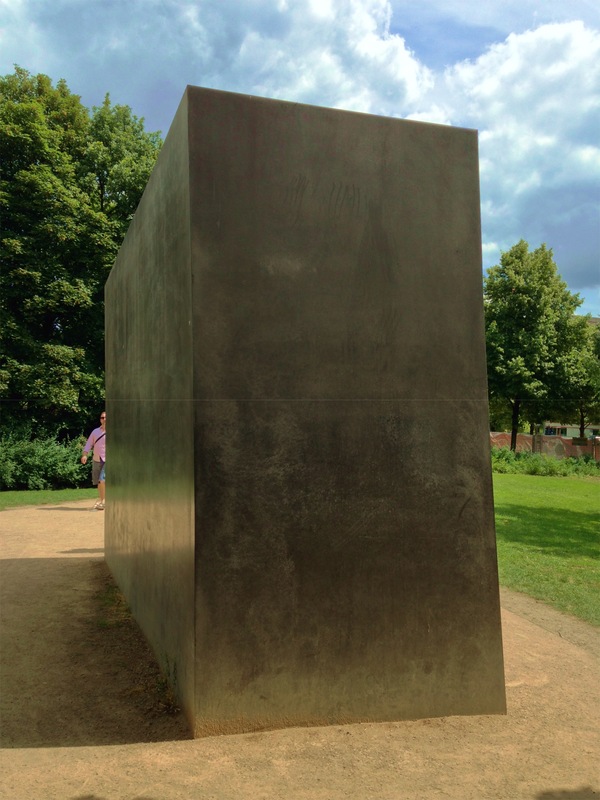 This memorial was particularly powerful. Just contemplating the number of victims and their fates was disturbing. These people had no idea where they were going. They had no clue what was going on, or what was going to happen to them. Being able to try to put yourself in their shoes and identify with the victims is an important part of remembrance at this specific site. It is a very hard thing to do trying to imagine all the emotions these people were experiencing. 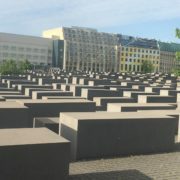 Josefine also told us that she only knew of this memorial because she receives emails from organizations involved with the memory of the Holocaust in Berlin. 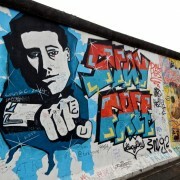 This site is off the beaten path and even people who have lived in Berlin their whole life do not even know this memorial is there. That is just strange to me; this memorial just seems too important and significant and more people should know about this major site of remembrance. One of the main camps the Jews were sent to was Auschwitz-Birkenau. 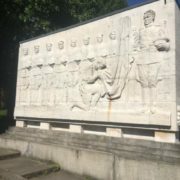 At first, this camp was occupied by Polish Political Prisoners and then was expanded in 1942 to be occupied by other larger groups being exterminated, such as the Jews, the Roma and Sinti people, and the Soviet Prisoners of War. The German phrase, “Arbeit Macht Frei,” written over the entrance gate translates as “work will set you free.” Every person who lost their life at the Auschwitz I camp saw this phrase while walking into the camp before their murder by the Nazi’s. 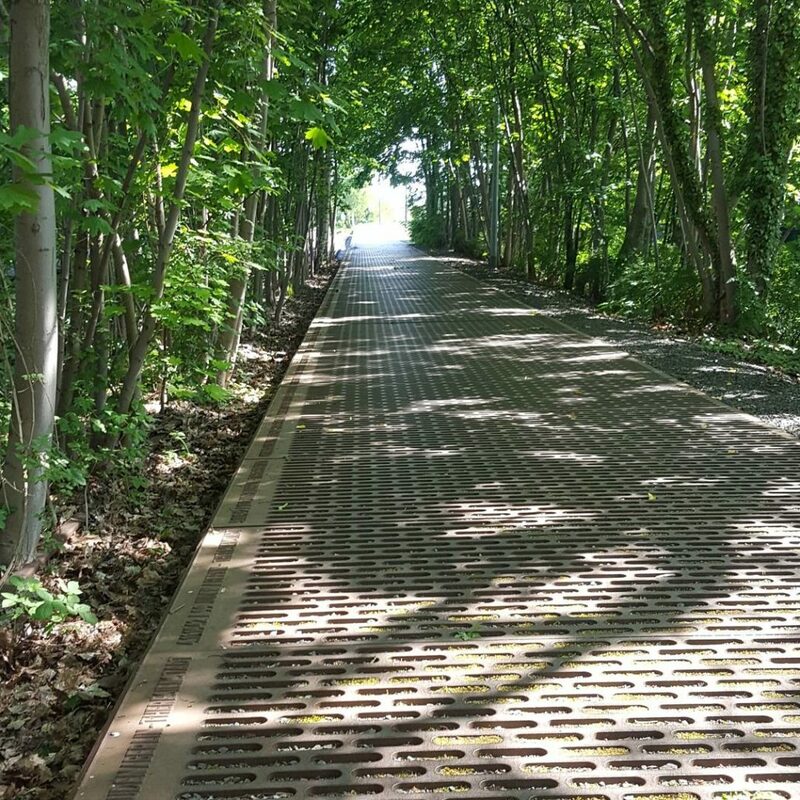 Also from Gleis 17; the pathway of all the plates with the concentration camps and number of victims from each one. 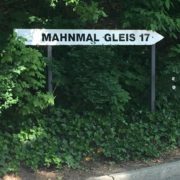 After seeing Gleis 17 and then being at this gate was a very pivotal moment for me thus far on our trip. Again, I was trying to place myself in the shoes of the victims and I simply couldn’t because it’s just such a hard thing to do when you didn’t grow up in the generation of World War II and the Holocaust. Another repeated theme of this topic in general was how everybody tried to forget the atrocity that happened during during the Nazi reign. Just standing at the gate and reading those German words made me uneasy. Many of the victims just thought they were going to a labor camp and not a death camp. They were innocent people and did not deserve to be murdered in such gruesome ways. Before coming to this program, I watched a lot of documentaries and read a few extra articles about the subject to try to prepare myself for what we were about to see. My preparation did not help me very much. I was still in awe and could not process all my emotions when we walked through this gate. This moment was profoundly moving not only for myself, but the rest of the group as well. After walking through the gate, we were led on a tour of the camps Auschwitz I and Auschwitz II-Birkenau. The other important point in the tour for me was when we went into the only gas chamber to have survived the war. In an effort to conceal the mass murders of the Jews, the Nazis destroyed many of the gas chambers and crematoriums that were used. After the gas chamber was the crematorium; another place that made my emotions flare up. Seeing the furnaces where people were thrown in carelessly was just difficult. I was so emotional, I couldn’t stay in both rooms for more than a couple of minutes. The memorial I mentioned above with the different languages commemorating the Jews who were killed in the concentration camps. Also during the tour, we went through rooms of Block 5 that contained personal belongings that were not destroyed before the camps were discovered and liberated by Allied forces around 1944-1945. Before entering the camp, the Nazis stripped prisoners of all their belongings, all the clothes they were wearing, and they shaved their heads, which would strip them of their identity. In the museum, there was a massive pile of shoes in one of the rooms. The majority of the shoes were black or gray in color and appeared to be deteriorating, but there were some shoes that were bright red in color that were in decent shape. In another show case in Block 5, there were massive piles of hair that were taller than me. The hair was used to make blankets, clothes, and other supplies to help the war effort. This is one sight I will never forget. I was so disgusted by this exhibit and the amount of hair that was on display; and this was only a small portion of the hair that was shaved from the prisoners. The last exhibit I will mention is the final exhibit in the museum, the enormous list of all the known names of the people murdered in the concentration camps and in the extermination camps. By putting this list in the museum, the prisoners become people and their identity that was stripped from them was restored. There were about 4.2 million names in this book from labor camps, ghettos, and death sites all across the continent. These two days spent at the Gleis 17 Memorial and at Auschwitz-Birkenau are ones I will never forget. Just the simple fact of knowing millions of people were once where I was standing is one too powerful to explain and one that will continue to impact my attitude to life daily.